Members of Boy Scout Troop 150 shopping for their Adopt-a-Family program. Photo courtesy of Boy Scout Troop 150. SPARTA, NJ – For over 10 years, Boy Scout Troop 150 in Sparta NJ has run their annual Adopt-a-Family program to help make Christmas a little merrier for families-in-need. 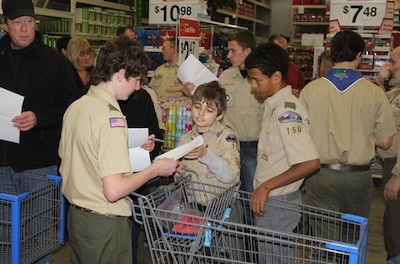 Last year, the 80 boy scouts of Troop 150 in Sparta NJ raised over $7,000 to purchase Christmas gifts for over 120 people in 42 families and supported the local food bank with 6 full carts of food. “This year the boys have their sights set toward higher goals” explains scoutmaster Joe Fucito “This year we hope to help even more families with a goal of raising over $8,000 to buy Christmas gifts for 140 people needing help and we hope to contribute even more food to the food bank”. Families are selected based on need through local community churches. Ninety percent of the items purchased are shoes, socks, coats, other essential clothing and blankets. On Monday December 15th the Scouts of Troop 150 will descend on the Franklin Wal-Mart, break into small patrols, and be given a list and a budget to buy gifts items for people in need. The gifts will be bagged for each family and then are delivered the next morning to the churches for distribution to the families. It is the scouts themselves who run the program and do all the shopping. Here’s how YOU can help: Checks, payable to Boy Scout Troop 150, can be hand delivered to the scouts at their weekly meetings, Mondays at 7 pm at the United Methodist Church, 71 County Rd 517 Sparta NJ or at the Franklin Wal-Mart on the evening of December 15th. Checks may also be mailed to: Joe Toscano, CP Engineers, LLC 35 Sparta Ave. Sparta. 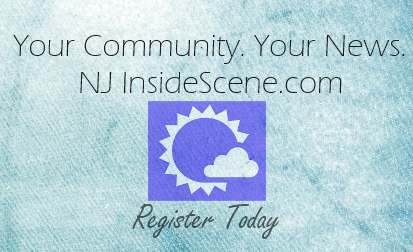 NJ 07871.